The electrical stimulus of each heartbeat is generated by the sinus node, and from there it is distributed to both atria arriving later to the AV node. This atrial electrical activity is reflected on the electrocardiogram as the P wave. The P wave is the initial wave of the cardiac cycle and is considered normal when it measures less than 2.5 mm (0.25 mV) in height and less than 0.12 s in length (3 small squares). This wave is formed by the superposition of the depolarization of the right atrium (initial part) and of the left atrium (final part). In lead V1, where the P wave has a biphasic morphology, it is common to observe both components, with the first positive portion corresponding to the right atrium and the second negative portion corresponding to the left atrium 1. 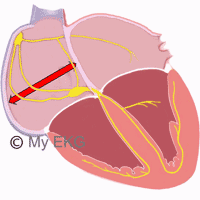 Right atrial enlargement usually causes alterations in the P wave morphology, especially in its initial part. Right atrial enlargement causes an increase in the voltage of the P wave, or what is the same, a P wave higher than 2.5 mm. If there is no accompanying left atrial enlargement, there is no increase in the duration of the P wave. This high P wave with a normal duration is classically called P pulmonale. It is seen more clearly in inferior leads. P wave higher than 2.5 mV with normal duration. In lead V1, a high initial component (greater than 1.5 mV) with normal duration is also observed. The electrical axis of the P wave (it is not the same as the QRS axis) can also be deviated to the right or what is the same between 75º and 90º 2. Summarizing: The most striking sign of right atrial growth is high, higher P wave 2.5 mm (2.5 mV) in inferior leads and a high initial component in lead V1, greater than 1.5 mm. P wave with its initial portion with higher voltage. The presence of P pulmonale in the EKG is a sign with limited sensitivity and specificity, because it is not always present when right atrial enlargement is confirmed by echocardiogram, and it may be observed on patients with normal right atrium 1. Right atrial enlargement is usually associated with hypertrophy or dilation of the right ventricle. Any pathology that causes pressure overload in the right cavities may cause dilatation of the right atrium. It is common to find P waves on the EKG of patients with chronic obstructive pulmonary disease (COPD), although it is not always present 3. In patients with pulmonary hypertension, P pulmonale waves can also be observed in the electrocardiogram. Pransient P pulmonale may be observed in acute pulmonary embolism, especially in high-risk pulmonary embolism. It may also be present in pneumothorax or in massive pulmonary effusion 3. Tricuspid stenosis is s an exceptionally rare clinical condition, almost always secondary to rheumatic disease 4. On the EKG it is observed as an isolated P pulmonale, or with signs of biatrial enlargement whether mitral valve disease also exists 3. Tricuspid regurgitation does not usually present with a typical pattern on the EKG, and it is rare to observe high P waves. The most common EKG finding of tricuspid regurgitationis is atrial fibrillation 3. Pulmonary stenosis causes an increase in pressure in the right ventricle as in the right atrium, so high P waves can be observed accompanied by electrocardiographic signs of right ventricular hypertrophy 3. Tetralogy of Fallot, Eisenmenger syndrome, congenital pulmonary stenosis or tricuspid atresia may cause P pulmonale on the EKG. Lung diseases: COPD, pulmonary hypertension, pulmonary embolism, pneumothorax, massive pulmonary effusion. Right-sided valve diseases: Tricuspid stenosis, pulmonary stenosis. Congenital heart diseases: Tetralogy of Fallot, Eisenmenger syndrome, congenital pulmonary stenosis, tricuspid atresia. 1. Goldberger A. Clinical Electrocardiography: A Simplified Approach. 7a ed. Philadelphia: Mosby Elservier; 2006. 3. Harrigan RA, Jones K. Conditions affecting the right side of the heart. BBMJ 2002;324:1201. 4. Bruce CJ, Connolly HM. Right-Sided Valve Disease Deserves a Little More Respect. Circulation. 2009;119:2726-2734. DOI: https://doi.org/10.1161/CIRCULATIONAHA.108.776021.